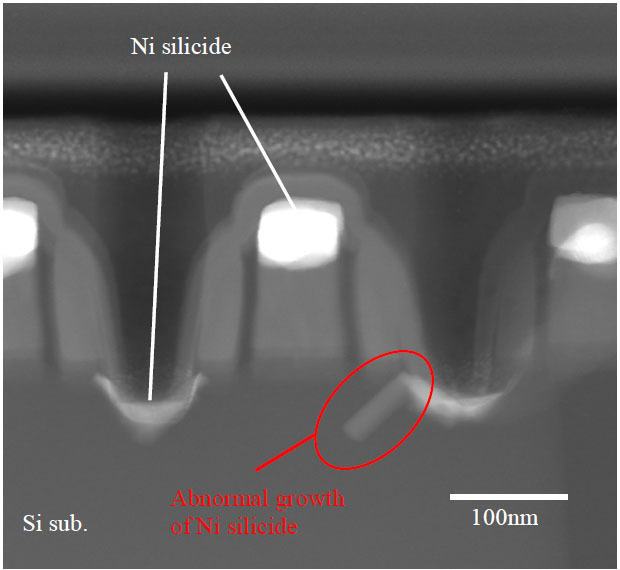 The cross-sectional STEM image of a MOS transistor in Figure 2443 presents nickel silicide penetration into junction due to the abnormal growth of the Ni silicide. This Ni silicide penetration induced junction leakage-current in the MOS transistor. With plasmon loss in EELS, Kudo et al. suggested that the Ni silicide in the abnormal growth area was nickel-disilicide (NiSi2). Starting from the understanding of the various mechanisms of crystalline growth, the abnormal growth can suppressed by controlling the crystal microstructure of the Si substrate, for instance, by using Si ion implantation , nitrogen ion implantation , the optimization of the conditions of gate sidewall etching , or the choice of the substrate direction . S. Kudo, Y. Hirose, N. Hashikawa, T. Yamaguchi, K. Kashihara, K. Maekawa, K. Asai, N. Murata, K. Asayama and E. Murakami, Analysis of Ni Silicide Abnormal Growth Mechanism Using Advanced TEM Techniques, IEEE International Reliability Physics Symposium, 2008. IRPS (2008) 10074334. T. Yamaguchi et al., “Suppression of Anomalous Gate Edge Leakage Current by Control of Ni Silicidation Region using Si Ion Implantation Technique”, IEDM Tech. Dig., 2006, pp855-858. K. Kashihara et al., “Improvement of thermal stability of nickel silicide using N2 ion implantation prior to nickel film deposition”, Proceedings of The 6th International Workshop on Junction Technology, 2006, pp176-179. T. Yamaguchi et al., “A Novel Low Leakage-Current Ni Silicide Process in nMOSFETs on Si (110) Substrate”, IEDM Tech. Dig., 2007, pp139-142.